So you have a GoDaddy server and you want to send email through your newly acquired SMTP Relay. Well “you can’t” is probably what you are going to find if you do some poking around Google. Our dedicated servers have an outbound email limit of 1000 per day. If you need to send more than 1000 emails per day, please call Customer Support or open a support ticket to request a higher limit. I shouldn’t have to justify my use cases and business to a company that I am paying over $200 a month for a dedicated server. If you are going to be sending email through your residential cable internet service you should be aware that most of these ISPs will block access to third party SMTP servers through the default port 25. In this case you can use the alternative port of 2525 when configuring your SMTP connection to get around this problem. This seemed to be exactly what I was looking for. 1. 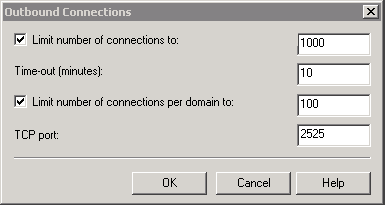 In IIS Manager, right-click the SMTP virtual server, and then click Properties. Click the Delivery tab, and click Outbound connections. 4. Click OK and then then you are done. I first discovered this setback with GoDaddy, as I was testing my smart host setup on a GoDaddy dedicated server. This was sort of a pain in the you know what, but it is understandable and appreciated that they go through basic steps to stop spammers on their infrastructure. Luckily for me SocketLabs Email On-Demand has come through with a solution for their customers.